The finals are finally upon us! The one week break between the home and away season and finals footy has felt like an eternity, but thanks to AFL CEO Gil “I’m only in charge of the AFL because of my last name” McLachlan’s decision to put arguably the most highly anticipated finals on a Thursday night, (still haven’t forgiven that decision AFL) the wait for September footy has been made one day shorter. Regardless of how you feel about the (ridiculous) fixturing of this game, one thing can be said for certain; this is going to be an absolute blockbuster of a game. Richmond go into this match undefeated all season at the MCG (ignore their away record) and Hawthorn go in as one of the most in-form teams of the competition. Hawthorn’s return to form was likely sparked by a response from the players and coaching staff after the dismal performance against Brisbane in round 17, when the Hawks got smashed by a young and upcoming Lions team by 33 points, in their fortress down in Launceston no less. Hawthorn have since gone on to win their final six games of the season to storm into a top 4 position, including an impressive win against Sydney in their final game of the season to seal their position in the top 4. Hawthorn captain Jarryd Roughead recently acknowledged in a press conference that the fallout after the Brisbane result played a large part in the hawks return to form. This is quite contrary to Richmond’s season, who, despite their dominance all year, go into this game in a minor slump in form, seemingly just, ‘going through the motions’ in many of the latter games in the season. Whether or not their relaxed approach going into September works against Richmond or in their favour remains to seen, however it will almost certainly factor into the result of this game one way or another. For this match, Hawthorn see the back of David Mirra, Kaiden Brand and Teia Miles, and welcome back to their side key defender James Frawley, the Italian Stallion James Sicily and the ‘Cegs Machine’ Jono Ceglar, who is a bizarre inclusion considering McEvoy is fit and firing and Richmond only have 1 player above 195 cm. Nevertheless, these inclusions are all massive for Hawthorn’s chances in this game, most notably Sicily, who had been stellar this season across half-back before injuring his wrist a few weeks ago. Richmond make just one change ahead of this game, with running man Kane Lambert replacing Brandon Ellis, who is arguably quite unlucky to miss out, further highlighting the depth in Richmond’s list. Attack the corridor. The only way Hawthorn are going to have any chance of beating Richmond is to take the game through the centre and change the angles in possession. This was a tactic used frequently by the Western Bulldogs in the final game of the home and away season against the tigers, and it worked to great effect, with the doggies falling short by just three points against the minor premiers. 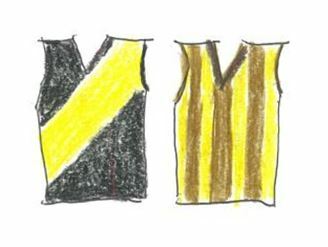 This tactic is one that Clarkson has also mastered over the years, however Hawthorn’s ability to execute this plan under constant tiger pressure, as well as in expected rainy conditions on the night, will be pivotal in determining the result of this game. Just keep doing what they’ve been doing all season. The tigers frantic tackling pressure that their gameplan is built upon holds up in finals football, which was proven last year when they went on to win the flag. If Richmond provide this sort of pressure against the Hawks for four quarters of footy, the tigers will be very tough to beat. Jack Gunston: One weakness to Hawthorn’s side all season has been their lackluster forwardline, with Roughead missing gametime through injury and the retirement of Cyril Rioli playing a big part in the reason for that. However, one forward that has been consistent for Hawthorn all year is Jack Gunston, who is currently in a purple patch in front of goal. However, he is coming up against one of the best defenses in the competition in Richmond, with Jack likely to match up against one of the best defensive talls in the competition, David Astbury. This will be a huge test for Gunston, but if he’s able to bag himself a few goals in this match, it will go a long way in getting Hawthorn the victory. Dustin Martin: If Hawthorn are any chance of winning this game, they need to curb the influence of Dusty. With Daniel Howe not getting a callup and Richmond almost exclusively not using a tagger, it will likely be a group midfield effort to keep the reigning Brownlow medallist quiet, however they need to also be wary of him drifting forward and being a presence in the forward 50. If Hawthorn can win the midfield battle and find a suitable matchup for him up forward, he will likely have down game, but if Richmond can get Dusty up and firing, the tigers will be near impossible to beat. Although Hawthorn’s recent form has been impressive, it is unlikely it will be enough to overthrow this all-conquering Richmond outfit, whose record at the ‘G is hard to ignore. The heavy rain forecast for this match will also play into Richmond’s hands, whose gamestyle of relentless tackling pressure will benefit from the resulting scrappy conditions of a downpour. You can expect Clarko’s men to put up a valiant fight, but it won’t be enough to stop the dominant tigers. Well I thought the Hawks would win, shows you how much I know. The Tiges don’t look as dominant as all conquering 1980, but something about them recalls Hawthorn ’88. They struggled to put away a competitive Carlton in the second semi, in the rain, then made mincemeat of Melbourne in the grand final. Could their opponent in this grand final be the luckless demons? I think West Coast are realistically the only team that can challenge Richmond at the moment. Melbourne certainly have the talent on feild to challenge the tigers, but I think their lack of finals experience will be their downfall. jan courtin on Round 5 – Richmond v Sydney: Go the Mighty Bloods – I love you, win or lose! Joe De Petro on Round 5 – Richmond v Sydney: Go the Mighty Bloods – I love you, win or lose!